We meet Jerry Allen at the Post Office along the main highway that runs through tiny Pepeekeo, Hawaii. It is raining. We follow him back along the highway and onto a heavily rutted road that takes us to our destination: acres and acres of macadamia orchards. There we get out of our vehicles and walk between rows of trees as Jerry explains the growing season (late July through early March), the harvesting (the nuts fall from the trees onto the ground, and his crop is harvested by hand, although some growers use mechanized harvesting tools), and the complex processing of the one of the island’s most sought-after resources. Jerry lives on Oahu in the windward town of Kailua (population 36,513), but his macadamia groves are on the Big Island of Hawai’i. The trees, he explains, need a warm, rainy climate, and the Hilo coast of the Big Island is one of the best places on earth to grow macadamia nuts. Jerry has lived with his wife, Bev, in the same house in Kailua since 1964. (“Oahu is the most beautiful of the islands,” he says.) Following his graduation from Iowa State in 1955 with a degree in engineering, Jerry was a member of the Pacific Air Force in Hawaii and served during the Vietnam War before going to work for C. Brewer & Co. Ltd., a major player in Hawaii’s sugar cane industry that had also diversified into the macadamia business. 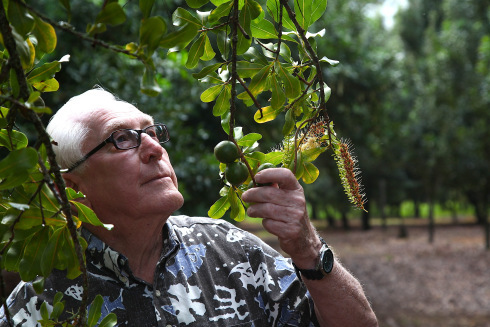 He was part of the team that created the well-known Mauna Loa Macadamia Nut Corporation. Today Jerry owns, leases, or manages orchards that produce two percent of the entire Hawaiian macadamia nut crop.